Air Torque – Italy, design and manufacture a range of SIL3 and Atex Ex (for explosive atmospheres) certified pneumatic rack & pinion AT Series actuators in aluminium and stainless steel. 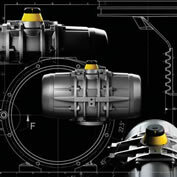 Air Torque actuators operate on pressures of up to 8 bar as standard. 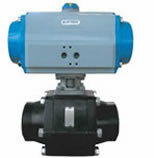 The actuators can be operated with air or inert gas and are Atex certified for explosive atmospheres. Air Torque actuators are continuously on test, they have been tested to 4 million cycles! Global Supply Line are sole regional agents for Air Torque. To view our stock list of Air Torque AT Series actuators click here. A wide range is available in both double acting and spring return delivering torques up to 11,000 Nm. Eighteen models provide a highly economical sizing selection. 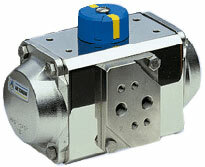 As well as conventional quarter turn actuators, Air Torque also offers actuators for special applications such as: forged stainless steel actuators, 120, 135 degree and 180 degree double acting actuators, 180 degree spring return, and 180 degree spring return with 90 degree fail safety position, as well as fast acting actuators. Water or bio-oil can also be used to drive the AT series if ordered with correct trim (see separate brochure for water trim). PED 97/23/EC. ATEX 94/9/EC. SIL3 IEC 61508. GOST-R. DNV type approval. Starline Spa and Air Torque Spa are situated in the one facility. The world’s largest compact actuator manufacturer and the world’s premier forged floating & trunnion ball valve manufacturer and in the same Bergamo manufacturing site, one of the most modern in the world. For turnkey supply of actuated valve packages a single source solution provides assurance of compatibility and quality as well as competitive, reliable delivery times. In accordance with stringent European requirements, Air Torque actuators are under a continuously automatic cycle test programme to ensure efficiency. Air Torque actuators and all parts are 100% western European made and exclusively manufactured in Italy. 4th generation Airtorque actuators have external travel stops for open and close position adjustable from -5° to +15° and from +75° to +95°. This special feature eliminates alignment problems due to a clearance of connections between the stem of the valve adaptor and the shaft of the actuator. A triple piston bearing system provides Airtorque actuators with a constant torque, even under high loads. In addition to the guides on the outside of the piston there is an additional guide inside which absorbs the cross load through the integrated support at the drive shaft. Other available options include gear over-rides and hydraulic dampners. The drive shaft is held in position by two bearings, one at the top of the pinion, one at the bottom. This ensures less friction and abrasion-free operation. Due to the special design of the bearings at the shoulders of the piston, the drive shaft is blowout proof and fulfills the stringent US standards for product liability. The drive shaft has a 25-30 µm electroless nickel coating (Protection E – Stainless steel). The bearings are temperature resistant to 155°C. Due to an internal retaining shoulder the bearings are blowout safe. Maintenance free spring cartridges allow a safe and simple assembly and disassembly. Therefore the adaptation of the AT actuators to your working conditions with the recommended pneumatic pressure can be arranged easily. Serial inspection: Each actuator has to pass a comprehensive serial inspection with e.g. a tightness / density check and a torque check. After passing the inspection the actuator is given a serial number according to ISO 9001. 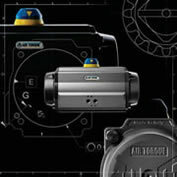 Air Torque also manufacture the ‘Top smart’ intrinsically safe compact valve position monitor with integrated diagnostics, self calibrating limit switches, integrated solenoid valve and air lines as well as practical stroke testing and contactless position sensing (can be fully integrated with intelligent safety plant instrument systems). This unit has smart functions like rotary motion counter, temperature indication and operating hours counter as well as solenoid valve status LED. Download brochure above at this web page. INCREASED EXTERNAL STROKE ADJUSTMENTThe stroke adjustment in the OPEN and CLOSE position has been increased to 20° which provides an exact adjustment for a precise stroke. FLAT END CAP DESIGNOur new end cap design allows easier maintenance and service through a flat cover shape. IMPROVED VISUALISATIONThe accurate scaling allows a precise visualisation of the stroke range with-out further accessories. IMPROVED POSITION INDICATORA long-lasting connection requires components on eye-to-eye level, i.e. transferred to the position indicator, a solid stainless steel coupling for synchronisation with the sensor. 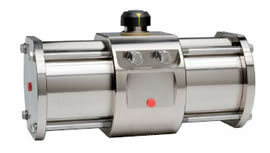 AIR TORQUE actuators offer a wide range of square & star connections. This in combination with ‘square reductions’ enables a flexible adaption for almost every application. TEMPERATURE RANGEThe temperature range of our standard actuators has been increased to -40°C with new and improved sealing materials. Almost all European locations can now be served with our standard actuators even during winter time.